With the Govt. of India already determined to help Indian eCommerce start-ups compete with established overseas giants, we highlight five ideas that will help them in their cause. 1) Aid of Search Engines: Besides improving SEO for their websites through use of strong keywords and link building, the start-ups must view themselves as search engines and not just eCommerce websites. According to a research by Nielsen, search success rates have increased from 74% to 92% since 2011, hinting that a majority of online shoppers Google a desired product even before visiting the website. Therefore, it is crucial that start-ups establish strong search engines and work hand-in-hand with Google for effective search engine optimization. This process also lets users compare the same product from two websites since the weighted review scores rank search results based on higher scores. 2) Hiring a consultant: For start-ups, it is also advisable to seek the help of an established eCommerce consultant such as Chitrangana, the innovators of the O2O business model in India. 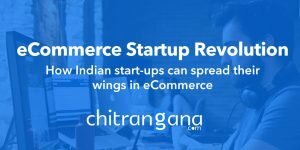 For nearly a decade, Chitrangana has helped several eCommerce start-ups find their footing in the Indian market. In their most recent report, Chitrangana.com advised start-ups to focus on specialised categories and a regional marketplace, instead of engaging in multiple categories and a wide array of products. They have also recommended start-ups to connect Online to Offline for small towns and rural India, which will help them tap into newer markets and the majority of the Indian population. 3) Sellers open to own websites: For the longest of time, sellers and vendors trusted Amazon above every other player in the market. However, that trend is quickly changing, and it should prove to be encouraging for the ambitious start-ups. In the U.S., for example, a recent survey revealed that 70% of the sellers were earning the majority of their revenue from self-run storefronts, while Amazon accounted for only 6% of their sales. A decade ago, sellers were far more comfortable routing everything via Amazon and settling for lesser margins. Another report revealed that, of the fastest growing eCommerce sellers in the U.S., only 27% reported Amazon as their top channel, and 43% sellers were looking at other websites. These numbers suggest that Amazon no longer has a stranglehold over the American market. And with the Govt. of India’s new eCommerce policy ready to be implemented, we could see the same trend following here. 4) The use of Chatbots: A recent report revealed that most customers prefer interacting with eCommerce websites via text messages and live chat instead of phone or e-mail. However, with the aid of Artificial Intelligence, these Chatbots no longer answer only frequently asked questions (FAQ’s) but instead are able to answer a wide variety of queries. It is very crucial that Indian eCommerce start-ups establish an intelligent and responsive Chatbot system, to cater to queries and questions from users, at any given time of the day. In 2017, a research conducted by Ubisend revealed that 35% of eCommece consumers have asked for more chatbots. Of them, a whopping 69% revealed they prefer Chatbots to phone services due to instant access of information. Unlike Skype and other messenger services, users are not required to install Chatbots to their phones or personal computers. It is advisable that Indian eCommerce start-ups integrate a Chatbot to their website. 5) Voice commerce: A recent study revealed that 20% adults in the U.S. now own a smart speaker such as Amazon Echo or Google Home. Out of them, more than 33% have ordered groceries using the smart speakers, and nearly 22% avail of the services frequently. According to Chitrangana’s Research & Survey Team, there will be at least 75 million people in the U.S. who own a smart speaker by 2019. Gartner expects that 20% of internet browsing will be done without a screen by 2020. It is perhaps time for Indian eCommerce start-ups to follow suit and invest in a Voice commerce facility.